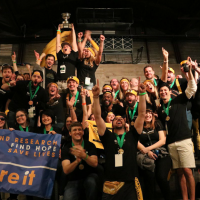 In advance of this year’s Austin Startup Games—which SpareFoot dominated last winter—we’re highlighting people who excel at the competition’s nine “sports.” So that we don’t lose our competitive edge, we’re featuring champs who you won’t see on the SpareFoot team (or any other team) Jan. 25 at the Austin Music Hall. Game on! Perhaps no one in the world knows more about the electronic basketball game Pop-A-Shot than Ken Cochran. After all, he’s the inventor, owner and CEO of Pop-A-Shot. Cochran leads the Pop-A-Shot movement from the small Kansas town of Salina. 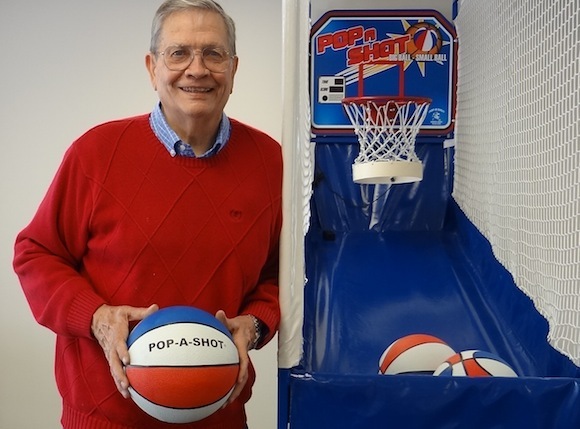 We reached out to Cochran for his advice on how to make your Pop-A-Shot game really pop. How do you master Pop-A-Shot? Well, first, it’s like everything else. You’ve got to practice correctly. If you are practicing all day and night, and doing it wrong, it doesn’t help. As the inventor of the game, I think the fastest way to score is with the backspin off the backboard. There are a lot of guys who just go for the pure shot. They are almost as good. But it appears to me that if you go off the backboard in the shooting square that you can get a higher score. Just focus, concentration and try not to fumble the ball. Once you fumble the ball, you break your rhythm and your score goes to pot. Well, I invented the game in 1982. It’s a strange story. I was a college basketball coach at Marymount College in Kansas. We were nationally ranked 10 years in a row. I got out of coaching in 1981. Our first games went into sports bars. We had one sports bar in Connecticut where they made $87,000 in two years off Pop-A-Shot. A Chinese girl set a world record by making 114 Pop-A-Shot attempts in a row. What are some of the common mistakes that people make when playing the game? I’ve seen a lot of guys shoot the ball underhanded. They try to get as close as they can. They are leaning over like crazy. I’ve seen them shoot underhanded, not “dominant hand.” You shoot it just like a regulation basketball—you know, fingertip control and you just put backspin, flip your wrist up and just keep a river of basketballs in the air. And you can do that as long as you make the basket. Once you miss one, then it is chaos because it screws up your rhythm. To be a great shooter, you need to shoot and not miss more than one or two, tops. What are the rules? How do you win the game? You get a higher score than the other guy. That might make it simple, but I think the great fun in shooting Pop-A-Shot is when you’re a non-shooter and you’re trash-talking the shooter. You can bust his concentration: “You couldn’t throw BBs in the Grand Canyon. You can’t spit in the ocean.” That makes it really a lot of fun. You’ve got to have great rhythm, and you’ve got to keep a river of basketballs going or get a backspin off the backboard. I haven’t seen too many dead-ball shooters. It’s the same fundamental skills as shooting a basketball: Elbow in, eyes on the target and follow through. For a guy who is a great basketball shooter, he’s normally a great Pop-A-Shot shooter. How fierce is the competition across the country? If you look at the great Pop-A-Shot shooters on YouTube, the best is a Chinese girl who shoots left-handed and right-handed. She’s the best I ever saw. She was on a coin-op game. 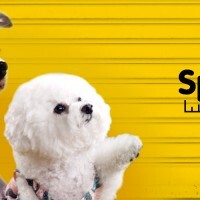 I don’t know what their bonus system was because they all score different because they have different bonus systems. She was left-handed, right-handed, left-handed, right-handed and didn’t miss one. Some of those games you can score up to 700 or 800 on them because of their bonus system. Pop-A-Shot is one of the games at the Austin Startup Games. What advice do you have for those participating in this year’s games? Practice your brains out. It’s the same thing I talked about before—the backspin off the backboard, have a great rhythm, try not to fumble the ball, keep a river of basketballs going, and keep your concentration and your focus. 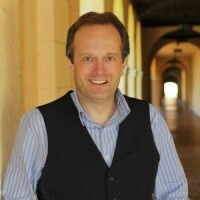 Troy is a Pulitzer Prize-nominated journalist, and bestselling author. He also writes for Reuters, Newsmax and The Huffington Post.